Grant us, we pray, O Lord, perseverance in obeying your will, that in our days the people dedicated to your service may grow in both merit and number. Through our Lord Jesus Christ, your Son, who lives and reigns with you in the unity of the Holy Spirit, one God, for ever and ever. Historically today is the feast of St. Mary of Clophas, Mother of St. James the Less and Joseph, wife of Cleophas (or Clopas or Alpheus). She was one of the "Three Marys" who served Jesus and was present at the Crucifixion , and accompanied Mary Magdalen to the tomb of Christ. Tradition reports that she went to Spain as a missionary. 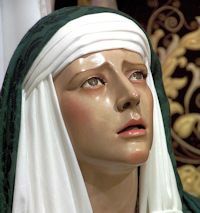 Mary reportedly died at Ciudad Rodrigo. Another tradition states that she went to France with St. Lazarus and his sisters. Also St. Gaucherius' feast is historically celebrated today. He was also know as Walter, abbot-founder and friend of St. Stephen of Grandmont. He founded St. John's Monastery at Aureilfor and a convent for women. "And there were standing by the cross of Jesus His mother and His mother's sister, Mary of Cleophas, and Mary Magdalen." How should we understand "His mother's sister," literally, as in having the same parents, or in the same sense that Jesus's "brothers" are to be understood as close relatives? The short answer is that Mary of Cleophas is probably the Blessed Virgin's sister-in-law. Mary of Cleophas may have had a previous husband named Alpheus, or this Alpheus may have been Cleophas. The Blessed Virgin Mary, of course, only had one husband (Joseph) and remained a virgin. The long answer may be found here. Born in Meulan-sur-Seine to the northwest of Paris, he received a classical education and became a priest. However he felt a deep longing for solitude and a life more radically centered on God. He thereupon devoted his life God as a hermit and began with his friend, Germond, to reside in the area of Limoges. Alone and forgotten by the world, Gaucherius and Germond grew in holiness. Their example attracted others who built hermitages near to theirs. Finally Gaucherius decided to build a monastery at Aureil and to establish two communities, one for men, the other for women, both under the rule of St. Augustine. The passage of an eremitical settlement into the canonical life was one of the principal ways through which the canons regular grew in the 11th and 12th Century. The community of Aureil is typical of these kinds of Ordo Novus canons regular. Thereafter he lived with his companions, being for all a model of sanctity. 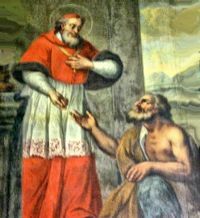 His companions and disciples include St. Lambert of Angouleme and St. Faucherus as well as the founder of Grandmont monastery, St. Stephen Muret. He died 80 years old in 1140 and was canonized in 1194.